Bled is perfectly located at the foothill of the Julian Alps for those who wish to explore out beautiful mountains on foot. The easy walking routes can be done on your own (around the lake including some great viewpoints. For those that wish to hike through Triglav National Park, you may wish join one of our fantastic guided tours. The most daring can climb the highest mountain in Slovenia – Triglav 2864m. This climb should only be done with help of our experienced mountain guides. Cross country or manege horseback riding on the quarter (smaller, calm and kind) or larger horses for the more demanding. In the vicinity of Lake Bled, the old villages of Koritno, Bodešče and Ribno, or Sava river valley provide perfect backdrop in which to explore the beautiful surrounding of the forested prealpine world. Hydrospeed is ideal for those who want to be closer to the cristal clear water. With flippers on the feet and a floating boat, you will have the possibility to explore our rivers. Roaring rapids awaken your senses. Calm swirling pools restore your inner peace. Within these hallowed canyon walls, this glorious river’s never-ending current carries you to new discoveries of majesty and beauty, and to new heights of excitement and adventure. Canyoning is an unforgetable experience. The best thing about canyoning is discovering whilst following a water trail. If you are curious, you will love the magic of water and unspoilt nature, you will discover a new world which is normally inaccessible. Swimming, diving, sliding, games and fun are what make up this new adventure. 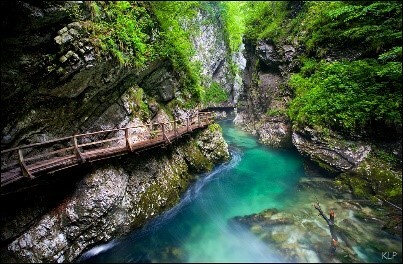 This water activity is for those, who wish to experience white waters of Slovenia more individually. We organize kayaking trips on rivers Sava (moderate) and Soca (moderate-difficult). We also organize kayak lessons, were we gradually take you from basic lessons on lake Bohinj to kayaking on Sava river. All transportation, guidance and equipment included. Paragliding is as close to flying as you can get and a tandem flight is the perfect way to enjoy your first flying experience. As a passenger you merely have to run a few short meters, during the take off. The wind will catch the chute, and off you go, higher and higher, soaring with the birds over the coast. You can take photographs, shout for joy or just sit back and relax in the comfortable foam harness while you enjoy the view. The Tandem skydive is by far the most popular way to make your first skydive. With minimal ground training, you are able to experience the exhilaration of freefall for nearly one minute before your tandem jumpmaster opens the parachute. Safely connected and ready for freefall, you will both exit the airplane and freefall together until you have descended to an altitude when the parachute will be pulled. The canopy (parachute) ride will last 4 -5 minutes. Not a fan of water sports or diving in the sky? Get your adrenaline rush on the ground! Roll down a small hill in a big ball in Slovenia's most picturesque places. Gather a group of friends and tag them with colours in the Slovenian woods! You will also get all the necessary and safety equipment, of course!